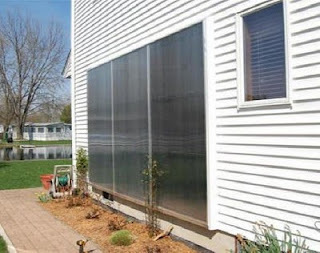 Knick has sent in a detailed description of his very nice, solar water heating system project. A very aesthetically pleasing collector -- the nicest I have seen. Large area, double glazed collectors oriented vertically should provide good performance through the winter without summer overheating. Some unique wrinkles in the collector internal design. The collector is three bays of the copper grid with aluminum fins that has been used in many of the $1K collectors. Knick used twinwall polycarbonate for the glazing, which improves winter performance and has a very nice look. Knick mounted the large collector vertically on the wall. This philosophy of using a somewhat oversized and vertically mounted collector gives good performance in the winter (when the sun is low) but does not tend to overheat in the summer when the sun is high. 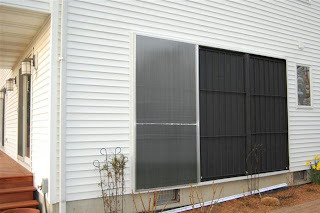 The result is a higher year round solar water heating fraction. 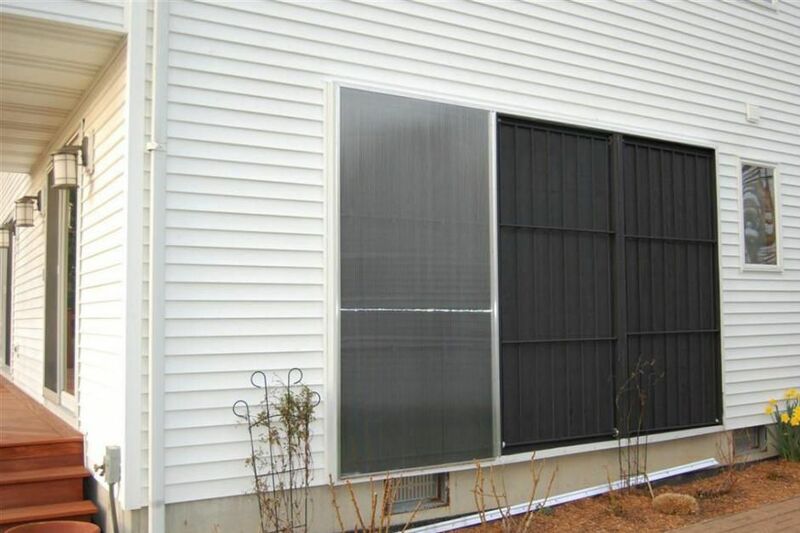 The wood frame collector is trimmed with aluminum, which gives good weather protection and also looks very nice. The non-pressurized 300 gallon heat storage tank is built using the "tried and true" plywood box over a 2 by lumber frame with an EPDM rubber sheet liner. The tank is insulated with rigid foam board insulation between the liner and the plywood box. This design has a 30+ year track record of being durable and trouble free. 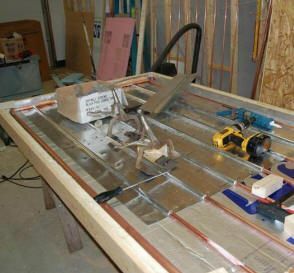 Knick used the large coil of PEX heat exchanger design. Great job --thanks to Knick for sending it in! I just want to say thanks to Gary and Tom as if it was not for them this would not have been possible for me. I never thought for a minute that my project would end up on two websites. P.S. Gary I would like to make a suggestion for your website. Is it possible to set something up where people can donate to build it solar? Appreciate the idea on the donations, but the Google click ads pay all the bills and a bit more. Since the website is a retirement hobby, I'm not really looking for any more than that. If it gets to the point where I'm running in the hole, I'll probably take you up on that.